Orson Welles’ unfinished final film, “The Other Side of the Wind,” is about to be completed. Netflix has acquired global rights to ‘The Other Side of the Wind” and is financing the completion. To complete the film the producers have hired an Academy Award winning editor and an Academy Award winning sound mixer, Bob Murawski as editor and Scott Millan as sound mixer. Netflix plans a 2018 release of the film. Welles shot the film-within-a-film between 1970 and 1976. He worked on the film until he died in 1985. He left behind a 45-minute rough cut he had smuggled out of France. John Huston plays a temperamental film director who is always fighting with Hollywood executives to finish a movie his way. This is what Welles did throughout his career. John Huston, of course, went on to be an amazing writer and director himself. He wrote the screenplays for most of the 37 feature films he directed, many of which are today considered classics: The Maltese Falcon (1941), The Treasure of the Sierra Madre (1948), The Asphalt Jungle (1950), The African Queen (1951), The Misfits (1961), Fat City (1972) and The Man Who Would Be King (1975). 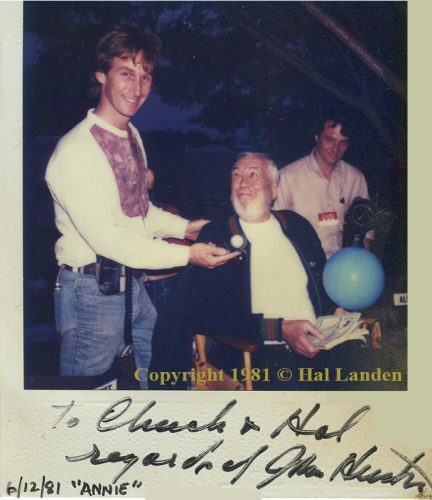 Chuck Clifton the Director of Photography is on the left, John Huston in the middle, and me, Hal Landen, on the right.